This is an astute and wide-ranging study of detective fiction in its historical contexts. The broad sweep of the discussion combined with close, perceptive attention to textual detail allows Gruesser to create a distinctive and valuable analysis of cross-cultural currents within American crime writing, shedding new light on the genre’s representations of gender, race and empire. Detective ﬁction merits scholarly attention not solely because so many people read it but also because it reﬂects the evolution of modern society. Despite detection’s association with British authors, manners, and settings, American writers invented both its classic, or (to use John Irwin’s more precise term) analytical, and hard-boiled varieties. Following the lead of John G. Cawelti in Adventure, Mystery, and Romance: Formula Stories as Art and Popular Culture (1976), several critics have emphasized the supposed rigidity of detective and mystery writing. A comprehensive analysis of American detection, however, reveals its adaptability to a multiplicity of artistic, personal, ideological, and political programs. The wide range of directions in which authors have taken the genre serves to substantiate Raymond Chandler’s contention in the ﬁrst epigraph to this chapter that it is a “ﬂuid” form that cannot be easily pigeonholed. No doubt Poe, who craved but never achieved sustained popular success as a ﬁction writer, would have been surprised to discover that in the second half of the 1800s the genre he launched would reappear in action-packed dime novels featuring protagonists such as the Old Sleuth, New York Detective, and Nick Carter, as well as a series of books about the exploits of America’s most famous detective agency (well known for its trademark open eye, the eye that never sleeps), supposedly written by Allan Pinkerton himself. He would certainly be shocked to learn that two generations after his death white women and African Americans would embrace detection as a means of addressing social and political issues of particular concern to themselves. Moreover, he would likely be amazed to ﬁnd that over the last 170 years the descendants of his aristocratic French sleuth C. Auguste Dupin have come in an array of shapes, sizes, nationalities, genders, socio-economic classes, sexual orientations, political points of view, subject positions, and ethnic and racial backgrounds. This work traces some of the roles that gender, race, and empire have played in American detection from Poe’s originary tales through the myriad variations upon them published before 1920 to hard-boiled ﬁction (the origins of which derive in part from turn-of-the- twentieth-century notions about gender, race and nationality), and it concludes with a discussion of contemporary mystery series with inner-city settings that address black male and black female heroism. John Cullen Gruesser, a professor of English at Kean University, is the author of The Empire Abroad and the Empire at Home: African American Literature and the Era of Overseas Expansion (2012) and the editor of A Century of Detection: Twenty Great Mystery Stories, 1841-1940 (2010). He currently serves as President of the Poe Studies Association. From its inception, American detective fiction has been adaptable to a multiplicity of artistic, personal, ideological and political programs. The wide range of directions in which authors have taken the genre reminds us of Raymond Chandler’s view that it is a “fluid” form that cannot be pigeonholed. This book highlights detection’s malleability by analyzing the works of particular groups of authors from specific time periods written in response to other texts. 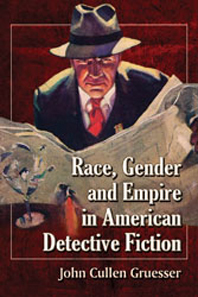 Specifically, it traces some of the roles that gender, race and empire have played in American detective fiction from Edgar Allan Poe’s works through the myriad variations upon them published before 1920 to hard-boiled fiction (the origins of which derive in part from turn-of-the-20th-century notions about gender, race and nationality), and it concludes with a discussion of contemporary mystery series with inner-city settings that address black male and black female heroism. In addition to fiction by Poe, the book analyzes texts by Nathaniel Hawthorne, Herman Melville, Harriet Jacobs, Mark Twain, Mary Wilkins Freeman, Susan Glaspell, Dashiell Hammett, Carroll John Daly, Pauline Hopkins, John Edward Bruce, Chester Himes, Walter Mosley, and Valerie Wilson Wesley.